WHAT IS ENTROPION? Entropion is an abnormal “ turning-in” of the eyelid. This turned-in eyelid causes hairs to rub on the cornea (the clear surface of the eye) irritating the surrounding tissues and potentially causing permanent damage to the cornea. WHAT CAUSES ENTROPION? Entropion is most commonly due to an inherited poor eyelid conformation. Entropion can result secondarily to eyelid spasm due to some other painful eye condition. Scarring of the surrounding muscle may result in permanent entropion. WHAT BREEDS ARE COMMONLY AFFECTED? Entropion is commonly seen in breeds such as the Bulldog, Bloodhound, Chow Chow, Shar Pei, Rottweiler, and Retreivers. These breeds are all prone to entropion, although any breed may be affected. HOW DO I KNOW THAT MY DOG HAS ENTROPION? Most owners notice that the affected eye is partially held shut and has excessive tearing. Both eyes are usually affected simultaneously (entropion can occur in the upper or lower eyelids, or in both upper and lower at the same time). Inherited entropion usually affects dogs under 1 year of age. HOW IS ENTROPION DIAGNOSED? A thorough examination of the eye is performed to make certain that there are no other painful eye conditions present that are causing an eyelid spasm. If none are found, a diagnosis of inherited entropion is made. HOW IS ENTROPION TREATED? Surgery is required to correct entropion. This involves removal of a small portion of skin to tighten the eyelid. 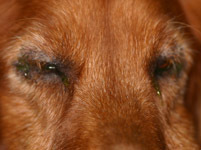 Temporary eyelid tacking may be used in very young dogs. Surgical correction is often delayed until the dog has a mature head conformation at 6 months of age. If the entropion is left uncorrected, the eyelid hairs will continue to rub on the surface of the eye, causing pain, corneal ulcers, pigmentation, and scarring which can result in vision loss. WILL ENTROPION RECUR AFTER SURGERY? In most cases, no. Some breeds however, such as the Shar Pei and Chow Chow, may have severe and complex entropion that requires several corrective surgeries due to their heavy brow. WHAT HAPPENS THE DAY OF SURGERY? The night before surgery, please take food and water away after midnight. The morning of surgery, please drop off your pet at 9 AM. An IV catheter is then placed in the leg to administer fluids during and after surgery. For surgery, a breathing tube will be placed in his/her windpipe to administer gas anesthetic. Heart rhythm, blood pressure, blood oxygen and carbon dioxide levels will all be closely monitored for the entire surgery. Pick up time is later the same day. This will be discussed in the morning of the drop off. WHAT WILL I NEED TO DO AT HOME? When using eye drops, be sure to hold the lids open so the medication is placed directly onto the eye. Keep the head collar on at all times, even at night. Wipe away any discharge from the eye with a clean, moist Kleenex or face cloth.